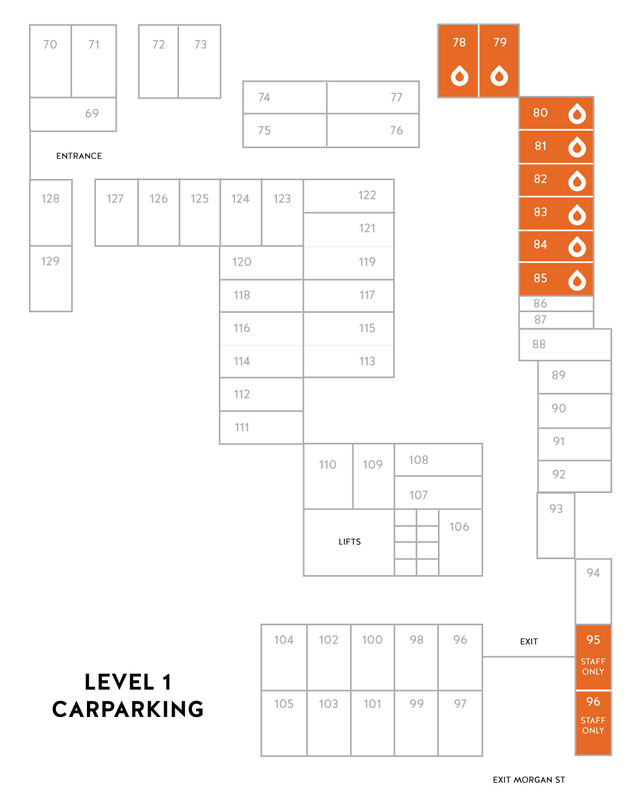 We have 8 parking spaces in the carpark above the studio which are free for our students to use while in class. 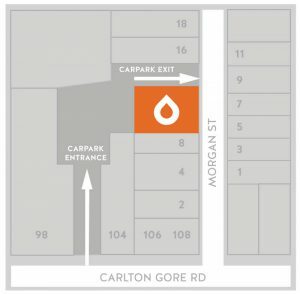 Enter the carpark by the ramp located at 100 Carlton Gore Road (see map). Go up the ramp, drive straight ahead, go under the building and follow the road around to your right. 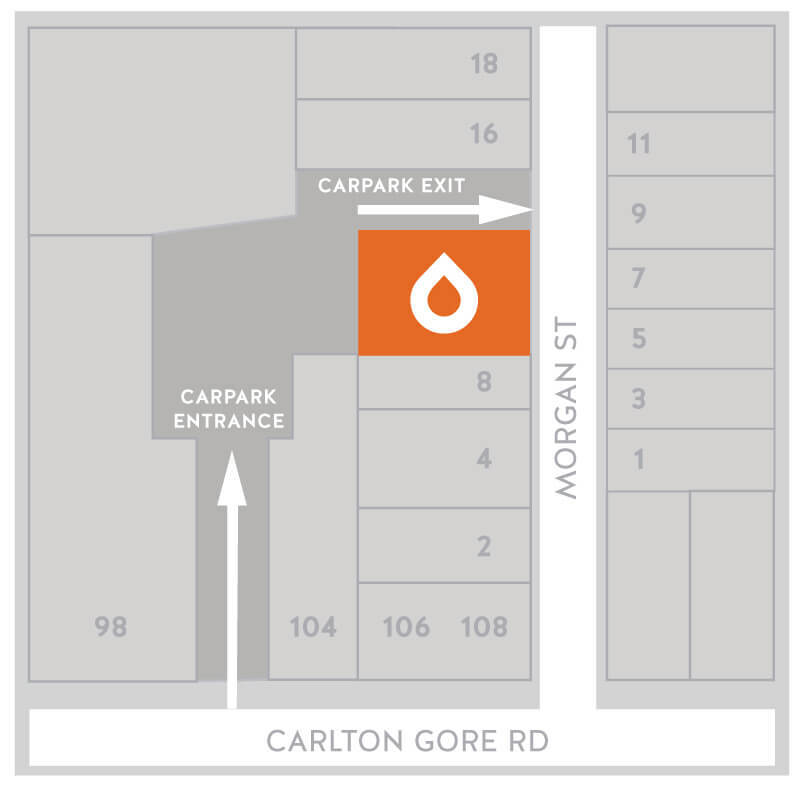 Our carparks are marked Sweat Yoga (see map). Exit the carpark down the ramp onto Morgan Street. Code for Parking 7581E. 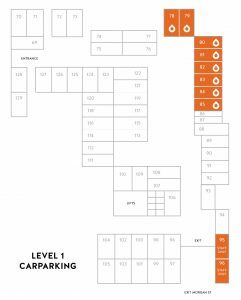 We ask that you leave within 15 minutes of class ending if you are using these carparks to enable the students for the next class to also take advantage of them. Metered parking is available on the streets around Morgan Street, Carlton Gore Road, George Street (8-6pm, free outside those times). You could also try the free 90 minute parking in the Domain – enter the Domain from George Street and park along Football Road. Should I sign in online? If you haven’t practised with us before, please use the following link to make yourself a log in and profile on our studio software, Mindbody. To be sure of a spot in any of our classes you can book using the Mindbody app (make Sweat Yoga a ‘favourite’) or using the timetable link on this website. We will hold your space for up to 10 minutes before class starts (after that, your spot may be given to someone else who is waiting). As a first-time student, what do I need to know? Please arrive at least 15 minutes before the class starts to allow yourself time to settle in. Doors will be locked five minutes before the scheduled class times to ensure classes start on time. Come prepared to sweat – dress accordingly, in attire that is comfortable for you. We suggest bringing a water bottle, a towel to cover your mat and a second towel if you plan to shower afterwards…along with a smile and an open mind! Is there mat and towel hire? Mat hire is $2. Towel hire is $2. Yes. We have four showers in the women’s bathroom and three in the men’s. Yes, please use this link to purchase giftcards. You will be emailed a giftcard to print out. Can I have my phone or other belongings with me in the yoga room? Please leave your phone outside the yoga room. If you have a special reason for needing to have your phone with you, please alert the teacher before class and set it to silent or vibrate. Please also leave your bags and shoes outside. We want the yoga room to be a calm and clutter free space. Why do you heat the room? Many cultures recognise the cleansing/purifying/healing properties of heat for both body and mind. The heat is intended to enhance your practice and help you see the results faster. The heat intensifies the cardiovascular nature of the practice and helps you stretch safely. When you sweat you are using you skin an organ of elimination and detoxification. If you are concerned about your ability to cope in the heat, let the teacher know before class and they can guide you on where to set up your mat. Focus on keeping your breath in and out by the nose and take breaks as you need them.